A massive throng of Pokémon Go players appeared in Central Park to catch a rare Vaporeon. Hilarity ensues. To call Pokémon Go a massive success so far would be a gross understatement. Despite privacy concerns, security pitfalls, and Pokémon-induced car crashes, people can’t get enough of Nintendo and Niantic’s latest creation. 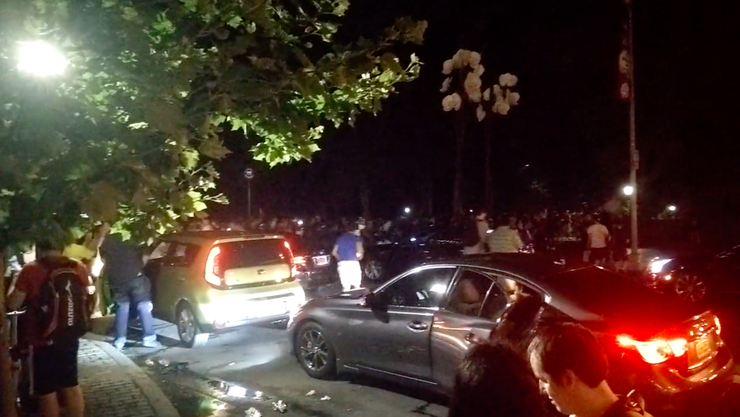 Case in point: Vimeo user Woodzys captured video (via The Verge) of a large crowd spontaneously gathering in New York City’s Central Park to catch a Vaporeon, a rare, water-type Pokémon. Whether or not you like Pokémon Go, you’ve got to admit that it’s kind of fun watching this sort of thing. As The Verge points out, this isn’t the first time Pokémon Go players have gathered en masse at a public spot to catch a rare Pokémon: For example, check out this video players gathering at a park in Bellevue, Washington to try and capture a Squirtle. Various businesses have tried to cash in on Pokémon fever over the last week or two. At their home game Friday night against the Toronto Blue Jays, the Oakland Athletics held a Pokémon Go promotion that featured discounted tickets, nearby gyms, and lures dropped around the ballpark. (According to the team, running on the field to catch Pokémon is a no-no.) Meanwhile, T-Mobile is offering free Pokémon Go data usage for a year, although not everyone is a fan of that idea. What do Sydney's famous landmarks look like in a Pokemon world?